Two regions in the brain have been linked to schizophrenia and psychosis, which may lead to earlier detection of this disorder and symptom, reported an imaging study funded by the National Institute of Mental Health (NIMH) that was published online last month in Biological Psychiatry. Background Patients with schizophrenia experience decreased activity in the prefrontal cortex ( blue, top figure) and excess activity in the basal ganglia (red, bottom figure). The greater the disconnect between these two regions, the higher the level of psychosis seen in these patients. Psychosis is a loss of contact with reality that usually includes false beliefs about what is taking place or who one is (delusions) and seeing or hearing things that aren’t there (hallucinations). Numerous medical problems can cause psychosis such as substance abuse, brain tumors, and certain mental disorders such as schizophrenia and bipolar disorder. Treatment approaches include hospitalization, antipsychotic drugs, and various psychosocial treatments. Too often, psychosis is not diagnosed or treated early enough. The longer this duration of untreated psychosis, the poorer the patient’s long-term functioning and response to treatment. In the United States, the average time between the first onset of psychotic symptoms and the initiation of treatment is about 110 weeks, or over 2 years. Disordered thinking and psychosis often go hand-in-hand in patients with the chronic brain disorder schizophrenia. A popular and long-standing theory in the field implicates the prefrontal cortex, the brain area just behind the forehead that normally supports higher-order capabilities such as prioritizing, categorizing, and strategizing. Damage to this area causes not only disordered thinking but also leads to psychosis from the excess release of the neurotransmitter dopamine into regions deep inside the brain. While this theory offers a compelling explanation for the co-occurrence of these two symptoms in schizophrenia, there have been only a small handful of studies that have directly supported this theory. Identification of the exact circuit(s) involved has so far remained elusive Professional Counselor Continuing Education “Schizophrenia is a very complex condition, involving a constellation of diverse symptoms. This diversity presents both a challenge and a constraint for figuring out the neurobiological root causes of schizophrenia. There is likely not just one lesion but a number of lesions that are present across different brain regions that are the proximal causes for these symptoms.” explained Jong H. Yoon, M.D., at the University of California, Davis, and lead author of the study. Yoon’s study focused on the prefrontal cortex and the basal ganglia. The basal ganglia is a subcortical collection of neuron clusters, including the ventral tegmental area and substantia nigra, which produce the majority of the brain’s dopamine, and the striatum, an important site of action of dopamine. Using functional magnetic resonance imaging (fMRI), the researchers examined the brain activity within the prefrontal cortex and basal ganglia of 18 individuals with schizophrenia and 19 healthy controls. The subjects completed a memory task in which they had to remember images of faces across a brief delay period to determine if subsequently presented faces were the same faces; it was hypothesized that patients with schizophrenia would have more difficulty performing this task. Results of the Study Patients with schizophrenia experienced excess activity in the substantia nigra, decreased activity in the prefrontal cortex, and diminished functional connectivity between these regions, suggesting that communication among these regions was out of sync. Additionally, the higher the level of connectivity between the substantia nigra and the striatum, the higher the level of psychosis seen in the patients with schizophrenia. Significance These findings suggest that the prefrontal cortex-basal ganglia circuit may be a common pathway linking cognitive deficits and psychosis in schizophrenia. 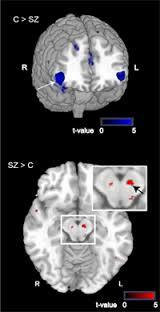 It also points to a more widespread use of fMRI in diagnosis and treatment. Compared to other neuroimaging techniques such as positron emission tomography (PET), fMRI yields more detailed images, does not use radiation, and is relatively widely available since most university-based brain imaging centers have this technology. These findings could also lead to the creation of a better animal model of psychosis, of which there currently are few. Biomedical research has shown that early detection and intervention could preempt later stages of diseases. This concept of “treatment as prevention” is seen in the NIMH-supported North American Prodrome Longitudinal Study (NAPLS), which is using biological assessments, such as neuroimaging, to predict who will convert to psychosis and to develop new treatment and prevention approaches. Another NIMH study, Recovery After an Initial Schizophrenia Episode (RAISE), supports the development and testing of two complementary models for early intervention in schizophrenia. Research is also underway to identify genes and environmental elements associated with schizophrenia. What’s Next Because the study involved patients with established illness who are already on antipsychotic medications, it needs replication in patients with schizophrenia who are not medicated and/or in the early phases of illness. The study should also be performed in individuals at high risk of developing psychosis to see if these findings could help identify individuals in the earliest stages of illness when interventions to prevent or significantly ameliorate schizophrenia can be instituted. To obtain greater precision in localizing brain regions, the study also warrants replication with high-resolution fMRI. Furthermore, the techniques in this study could also be applied to other disorders that can have psychosis as one of its symptoms, such as mood disorders, and post-traumatic stress disorder. Reference Yoon JH, Minzenberg MJ, Raouf S, D’Esposito M, Carter CS. Impaired Prefrontal-Basal Ganglia Functional Connectivity and Substantia Nigra Hyperactivity in Schizophrenia. Biological Psychiatry, published online January 14, 2013.